A Palladian window nestled in the gable and doors with colorful ruby glass windows add a hint of elegance to this classically detailed Victorian farmhouse. 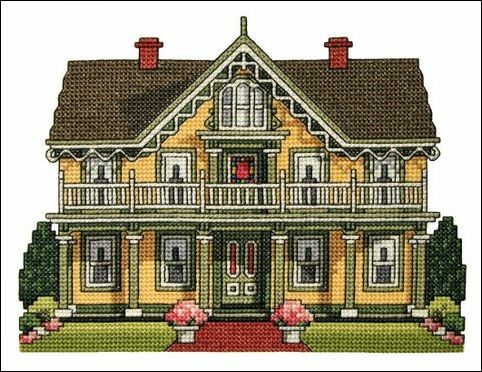 The main color in this design is light autumn gold with gray-green trim for the eaves, windows and columns. White accents are found on all the trim and railings while warm brick colors the two chimneys and walkway. Stitch count is 101w x 77h.